If you want to keep a little bit of your summer garden with you all year long, you can do so by drying herbs and storing them for use after your plants have fallen to the frost. Drying herbs is simple, can save you money, and imparts peace of mind—it’s nice knowing exactly where your food ingredients come from! The best time to cut herbs for drying is just before they flower, at which point the leaves contain the most oil. So keep an eye out for buds. If you’ve been harvesting all summer, your herbs may not have had a chance to flower. A good time to cut for drying is in late summer when plants are starting to flag. 1. Harvest. Use sharp scissors, a knife, or small pruners to snip steps from your plants. Cut when leaves are dry and free from dew (late morning or in the evening). 2. Prepare. Remove any damaged or discolored leaves, wash in cold water, and dry thoroughly. If herbs are left wet, they can mold and rot. 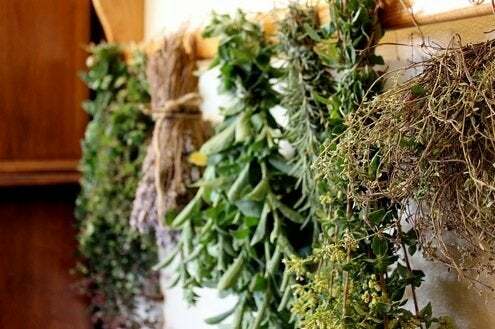 Using twine or string, tie the stems of your herbs into loose bunches. Make sure there is enough space for air to circulate around them. Turn your herbs upside down and hang in a warm, dry place that is out of the sunlight—an attic, for example, or an empty closet. If you don’t have a dark place to hang herbs, you can place them upside down in a paper bag, having cut holes for ventilation. Wrap the opening of the bag around the stems, securing the closure with rubber bands or string (this will also help to keep dust off). Hanging upside down allows the essential oils to flow downward from the stems to the leaves. Herbs with a higher moisture content (basil, tarragon, mint, lemon balm) need to be dried more quickly, so they won’t mold. Remove the leaves from stems and place on a cookie sheet or cooling rack. Place in a low oven, 180 degrees or less, for two to four hours, checking frequently until they are dry. 4. Store. Put dried herbs in labeled, airtight containers (plastic baggies, re-sealable plastic containers, canning jars) stored in a cool, dry place. For optimal flavor, store leaves whole, then crush before using. Leaves retain more oil when stored whole. 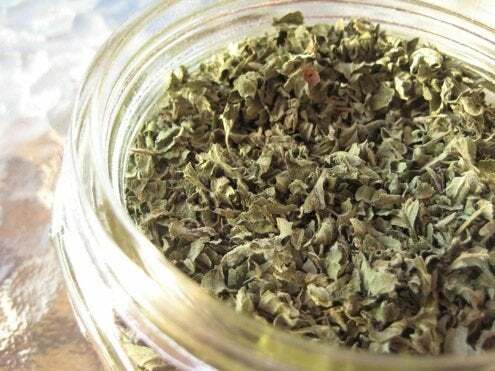 Your dried herbs will keep for a long time, but they are best used within one year, at which point they start to lose flavor. If the color fades, you’ll know the flavor has faded, too. But before that happens, you’ll have more herbs growing fresh in your garden to use. And as soon as the growing season ends, you can start the process all over again. A sustainable cycle to sustain a flavorful kitchen.